Adelaide City bounced back from two consecutive draws with a 3-1 victory against Adelaide Olympic in Round 6 of the NPL. 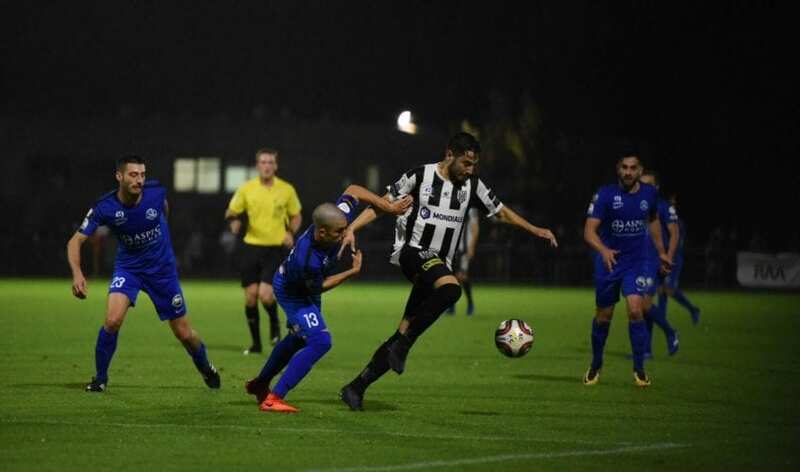 It was a cold and wet Monday night at Adelaide City Park but that did not deter City from picking up three valuable points. Adelaide Olympic started the game well with lots of possession and were pressing City high. Joseph Costa silenced their attack with a free kick that he superbly bent into the top corner to make it 1-0 for City in the 15th minute. On the 24th minute, Olympics’ Mamadi Kamara seemingly walked through the City defence, cut inside and slotted it past the Luke Ostbye to equalise. The game then took some time to settle as both teams looked to win the midfield battle. Kamara received a yellow card as a result of overstretching for the ball. A heated scuffle broke out in the 40th minute because of a late challenge. In the process, Kamara picked up a second yellow for his involvement and was sent off. This capped off an up and down night for the former Adelaide City man as his poor decision making reduced his side to ten men. Adelaide City retook the lead and capitalised on their numerical advantage on the stroke of half time. Nicholas Bucco picked up the ball just outside the area and was able to wrong-foot the keeper with a bullet shot. The second half featured a lot less drama but there was no lack of class from City. Marcos Flores was at his scintillating best, bursting through the midfield and slipping in the wingers. On the 56th minute, the ball fell to Flores who chested it down to Evan Kostopoulos and he bent it into the top corner for City’s third. Overall, it was a dominant performance from Adelaide City who were rarely troubled throughout the night. Assistant Coach, Ollie Totani was pleased with the commitment of the players as manager Michael Matricciani was away for the match. Despite picking up three points Totani didn’t enjoy the experience as the number one man on the sidelines for Adelaide City. Goalscorer, Evan Kostopoulos reiterated his assistant coach’s comments but highlighted areas that need improvement. Adelaide City has a short turn around to face West Adelaide on Saturday at VALO Football Centre at 5 pm.